Ivan Thanthiran, a medium budget Tamil movie that was released on June 30, had a good opening at the Chennai box office. The film is estimated to have collected Rs 1.5 crore in its first three days. However, the movie’s director and producer R Kannan’s celebrations were short lived as the Tamil Nadu theatres suspended screening of movies because of the heavy burden of taxes. Kannan ended up losing Rs 5 crore as he had spent Rs 6.50 crore on the film. Along with Ivan Thanthiran, six other Tamil movies released on June 30. But, the movies were not screened as the cinema theatres were shut. Lakshmi, a housewife, who watches most of the latest Tamil movies in Woodlands Symphony cinema hall located in Royapettah locality of Chennai, is unhappy as the four decade old cinema hall is now wearing a deserted look. Not far from Woodland Symphony cinema hall is Sathyam cinema hall, which too sports a big lock on its gate. The Tamil film industry or Kollywood, which is the country’s second biggest film industry after Bollywood, is passing through a crucial phase. The film industry is reeling under the burden of taxes. Those associated with cinema fear that the heavy taxes, which makes going to the cinemas costly, would end up harming the industry. And it is not the goods and services tax (GST) that is giving anxious moments to the industry. A 30 percent municipal tax on movie tickets introduced after the GST was launched on July 1 is what is making the film industry people edgy. In other words, now it is the state tax of 30 percent on tickets on top of the GST of 28 percent. Tamil Film Chamber of Commerce president Abirami Ramanathan says that the industry cannot stand this tax burden. The taxes could affect the livelihood of about one million people. To protest against the tax hike, more than 1,000 theatres across the state have suspended screening of movies since July 3. Every day, the film industry is losing Rs 10 crore through box office collections and Rs 5 crore through canteen sales, parking and ticket booking revenue. The immediate total loss in the past three days is Rs 50 crore. With each passing day, the losses will mount further. On top of that, there is enormous interest cost burden on the producers who are now stuck and are unable to release their films. “We estimate the interest burden per day around Rs 2 crore and hence an additional loss of Rs 6 crore due to that,” says Chennai-based producer G Dhananjayan. On an average, 240 Tamil movies are released in a year. 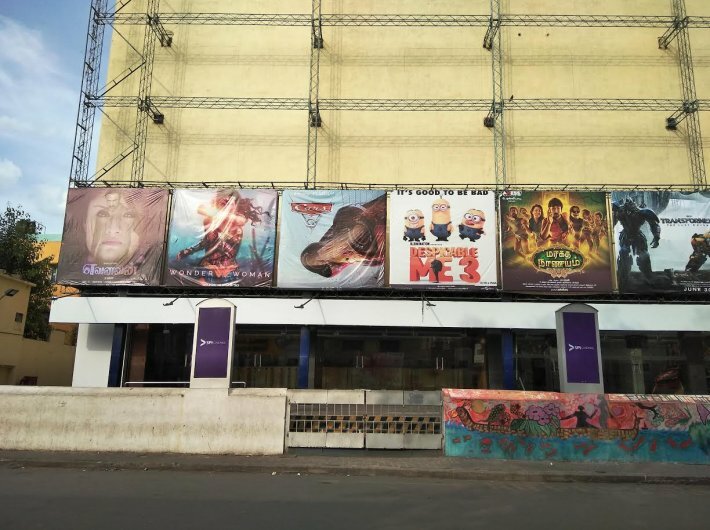 For Tamil films until June 30 this year, there were tax exemptions and the audiences were paying Rs 120 in multiplexes and around Rs 60 to Rs 80 in single screen theatres. These prices were effective from January 1, 2007 and the state government has not agreed to revise the prices despite the plea from the industry for more than four years now, explains Dhananjayan. He adds, the double whammy came in the form of GST, which is charged at 28 percent on Rs 120 (and 18 percent on ticket prices less than Rs 101). This steep increase in ticket price is going to impact the footfall as the audience who till now were paying Rs 120 and may not immediately accept such an increase. The second jolt is the local taxes at 30 percent on the ticket price. This means, the exhibitor shall end up getting only Rs 70 on a ticket of Rs 100. He will take 50 percent out of it and share Rs 35 with the distributor, who will take 10 percent commission and pay Rs 31.5 to the producer. While the government will get Rs 30 as local taxes, in addition to Rs 18 as GST on a Rs 100 ticket price, the producer shall end up getting just Rs 31.5 per ticket sold, “which is ridiculous and happens nowhere”, says Dhananjayan. After GST, state governments like West Bengal, Maharashtra, Telangana, Kerala have removed the local taxes on ticket prices and have gone to the extent of even reducing the state GST by 50 percent. Film director GNR Kumaravelan, who helmed Haridas, the movie that got him nominated for the Filmfare award for best Tamil director, is working on his next budget movie. With the tax burden, he has apprehensions in investing in this movie further, which he describes as his dream project. Artist and art director Thotha Tharrani says that now the Tamil film industry is coming up well after a lull. At this point of time, the burden of taxes would discourage even the directors to take up movies. This will seal the fate of the industry, he fears. He recalls how in 1960s, Chennai was the base for 45 percent of the world’s films. Hindi, Telugu, Kannada, Malayalam and even Italian and English movies were made in the studios of Chennai. Producer Dhananjayan says Tamil cinema has been an integral part of the state since 1931 when talkies came in. Since then, its influence has only gone up over the years. During pre-independence days, films played a large role in motivating people to fight for freedom. After that, reform oriented films started appearing from late 1940's to 1960's, which ushered in the Dravidian movement. C N Annadurai started writing story-screenplays for films. He was followed by M Karunanidhi and MG Ramachandran or MGR. Annadurai became the chief minister in 1967 and after his death in 1969, Karunandhi assumed that role. He was replaced by MGR in 1977 and he stayed in power till 1987. Jayalalithaa, an actress, ruled for another 10 years. The film industry, politics and the people of Tamil Nadu are one seamless whole. In the state, people spend a lot of time discussing politics and cinema.